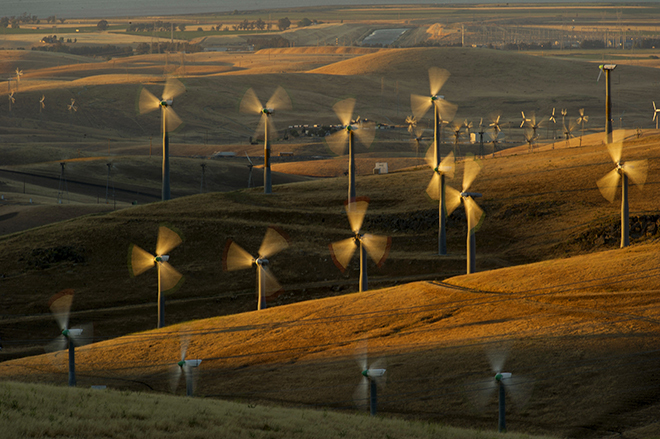 Altamont Pass, near Livermore, Calif., hosts some of the earliest modern wind farms in the United States. Several plants in the area have been or are in the process of being repowered. More than a dozen wind farms dating back to the early 1980s dot the bronzed, blustery hills of California's Altamont Pass, separating the San Francisco Bay Area from San Joaquin Valley, where a major modernization of the state's early renewable energy infrastructure is making visible progress. NextEra Energy Resources LLC, a subsidiary of NextEra Energy Inc., and privately held Salka LLC, are replacing hundreds of decades-old windmills with dozens of modern machines to re-energize two legacy sites while greatly reducing threats to endangered birds, primarily from blade strikes. The projects are part of an emerging trend at wind farms across the country, in which companies anticipate billions of dollars of investment in the next few years to refurbish, repower and replace aging turbines for both economic and environmental gains. The immediate window of opportunity, however, is closing fast, with diminishing federal production tax credits, or PTCs, for which wind repowering projects qualify, set to expire after 2019. At its 55-MW Summit Wind Repowering Project (Altamont Pass), which broke ground late last year, Salka plans to install 27 new 2-MW to 2.5-MW turbines in place of 569 old 100-kW units that harnessed the wind for PG&E Corp.'s Pacific Gas and Electric Co. until 2015. The developer, which in 2016 acquired repowering rights for the site, inked a deal in March to sell the renewed project to private equity firm Castlelake LP upon completion, targeted for late 2017 or 2018. Salka is "in discussions" with turbine suppliers and prospective buyers of the plant's output, CEO Jiddu Tapia said in an interview, pointing to "strong interest" from local power suppliers and corporations. Given existing relationships with landowners and agencies, "a more streamlined permitting process," the cost advantages of "modern, bigger, more efficient turbines" and "clear environmental benefits," upgrading older sites "is better than starting from scratch," Tapia said. Nearby, NextEra is replacing 283 retired wind mills with 20 towering 2.3-MW turbines from General Electric Co. at its 46-MW Golden Hills North wind farm. The project is underpinned by a contract to deliver electricity to Sonoma Clean Power once it comes online later this year. This follows NextEra's completion of its 86-MW Golden Hills Wind Project (NextEra) at the end of 2015, which replaced 370 old turbines with 48 new ones to supply power to Google Inc. and Kaiser Permanente. The current repowering drive focuses on turbines approximately a decade old and older, which represent a sizable and growing share of America's aging wind capacity base of about 85,000 MW, according S&P Global Market Intelligence data. Roughly 14% of U.S. wind capacity, or 11,705 MW, is over 10 years old. Of that, 4,236 MW is more than 15 years old and 1,562 MW is more than 20 years old. Most of the country's truly vintage, 30- to 40-year-old wind farms are in California. Several projects in Minnesota and Hawaii also are over 20 years old. Over the next four years, projects totaling nearly 35,000 MW, representing 41% of the country's wind capacity, will celebrate their 10-year anniversaries across the country, especially wind farms in Texas, the Midwest and the Northwest. Wind farms at or near their 10th birthdays are by far the most popular target for upgrades today, according to Jay Whitman, director of repowering at Vestas Americas, a subsidiary of Denmark's Vestas Wind Systems A/S, because they can often requalify for the PTC, which expires after 10 years. Installing new nacelles and rotors on existing towers at such projects can extend turbine life by 20 years and boost annual energy production up to 25%, depending on rotor size, Whitman said in a presentation at the American Wind Energy Association's annual conference last month in Anaheim, Calif. The Vestas repowering chief showed financial scenarios indicating returns in the range of 12% to 14% for a 10-year-old project sized 100 MW, depending on whether it qualifies for the full PTC value at the end of 2016, or 80% for projects that start by the end of this year. Full replacement, like Salka's and NextEra's Altamont Pass projects, is "prime for turbines at or near their end of usable life," Whitman said. Swapping hundreds of old turbines with dozens of more powerful new ones offers annual energy production gains of up to 50%, while slashing operation and maintenance costs around 40%, he estimated. Partially repowering, or "refurbishing" 10- to 15-year-old plants with selective turbine component upgrades also can boost annual production by up to 10%, he added, while reducing operation and maintenance costs by 10% and extending turbine life expectancy by 10 years. Nancy Rader, executive director of the California Wind Energy Association, or CalWEA, estimates that about 600 MW of wind capacity in the state already has been or is in the process of being repowered, either with new nacelles and rotors or entirely new foundations and turbines. That leaves an opportunity of up to 1,000 MW at the state's legacy wind farms, she estimates, mostly in the Altamont region and in Southern California's Tehachapi and San Gorgonio passes. But there are challenges to tapping that opportunity, Rader cautioned in an interview, including the fact that state utilities have covered their near-term renewables portfolio standard targets largely with solar photovoltaic contracts. That focus is contributing to midday oversupply, negative electricity prices and curtailment of solar generation, she said, problems the wind industry wants to address in part through repowering old sites. "Right now we have an imbalanced portfolio. Wind can help reduce solar curtailment," Rader said. "The least cost mix overall is a wind-solar mix." In response to a recent proposal from California Public Utilities Commission member Clifford Rechtschaffen to relaunch a renewable energy standard offer program targeted at smaller wholesale projects, CalWEA plans to counter with a pitch for a dedicated track for wind repowering projects 20 MW and under. "Given the limited amount of new wind in California, and the availability of the PTC through 2019, we think it makes sense to repower these at-risk projects," Rader said.